Pivot Points, an exhibition of paintings and poems by three generations of American artists and writers, has appeared in galleries in Peru and the United States. The exhibition highlights the relationships between mentor and student, with the student going on to become the teacher of the next generation. Pivot Points has a life as an exhibition and a catalog; Blackbird attempts to merge the sensibilities of the two in our documentation of the work. The arrangement in the show's physical exhibition space is by generation, not genre; visitors move from first-generation painters to first-generation poets. The catalog, however, segregates the painters from the poets in a physical binding with two front covers; that is, holding the painter's catalog, one can simply flip (pivot) the booklet to find the "back cover" is actually the front of the poet's catalog. The end of both documents is in the center of the booklet. We faced a dilemma in our documentation: should we organize by genre or by generation? A linked environment allows us to invite you to explore both by genre (with the Relationship Maps) or by generation (with the Exhibition Table). If you want to move sequentially by generation, find first-generation painter Victor Kord in the Exhibition Table or the Painters' Relationship Map. (See Navigation Help for further tips.) Once you have opened the commentary page for an artist or writer, you may view his or her work using a thumbnail menu of the work, or may move forward or backward in the Exhibition loop. First visit? Review the Navigation Help or open the Exhibition Table below to get an overview of content and commentary. 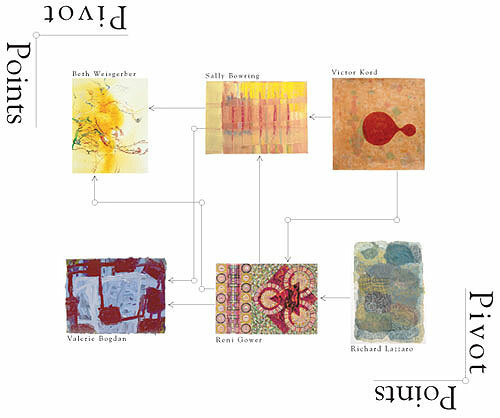 Pivot Points was organized by Virginia Commonwealth University artists and faculty members Reni Gower and Sally Bowring, both second-generation painters in the show. Blackbird Senior Editor Mary Flinn appears in the print catalog as the author of an introduction to the poets. Blackbird Senior Editor Gregory Donovan appears as a second-generation poet.